INTRO: This article is a continuation of Caitlin Williams three part series on the ever evolving Freshwater Pearl. In part 2 Caitlin dives into the world of bead nucleated Freshwater pearls, for part one click here. For the first few decades of Chinese freshwater pearl culture, the un-nucleated, solid nacre off round pearls were the big stars of the freshwater pearl world. But, from the beginning, the Chinese were also working on nucleated pearls and used a variety of carved mussel shell shapes to re-nucleate older mussels. Just a few of the fun shapes being produced with bead nucleated freshwater pearls. From the earliest days of Chinese perliculture, they experimented with nuclei in attempts to copy the nucleated Japanese freshwater pearls coming from Lake Biwa, then Lake Kasumiguara. Instead of round nuclei, the Chinese began with nuclei made from flat shapes never associated with any kind of pearls before then. The extremely popular coin shaped pearls were an invention in this trend, which also used square and diamond shapes too. Heart shaped pearls and star shaped pearls are also part of this inventory and are very popular shapes in the freshwater pearl world. These shapes, as with all pearls, were very hard to perfect with smooth skins, so the best of them are only a small proportion of the harvest. As with the non-nucleated pearls, the vast majority of these flat shapes are sold to beaders and manufacturers of bead jewelry. It appears that it was not easy to get the round shape with a nucleus, and for years, the mussels with round nuclei produced mostly what are called “fireball pearls” because its nacre not only covered the nucleus, it leaked beyond that and filled up what was probably the incision path, with a veritable nacre-flow. Not only did it produce odd pearls with tails, but they were often of the most astounding colors yet seen by consumers. The Chinese started mass marketing nucleated pearls with skins very similar to the ripple pattern of the Lake Kasumiguara pearls in the first decade of the 21st Century. Though the colors were rarely as intense, the rippled surface gave a lot of bright colors to quite round pearls with no comet tail. For a while these pearls were called “Chinese Kasumis”, now they are commonly called “ripple pearls”. 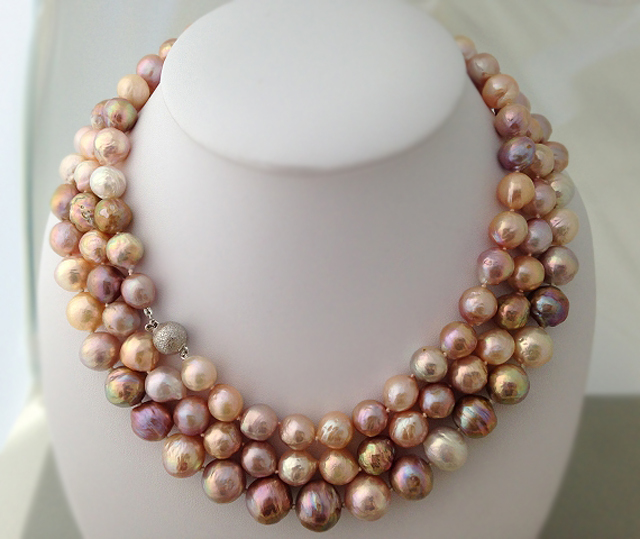 The luster is usually excellent on these ripple pearls. Though the most intense colors are extreme, those are rare and cost more. Edison Pearls is the brand name coined by Grace Pearl Company that first brought the huge, round, pearls to market. The best Edison pearl is a perfected pearl, huge, with a nucleus and a smooth skin, round shape, intense luster, and deep body color. We can now see that the ripple pearls were a step in the path to perfectly round freshwater pearls and are still being produced as part of the quality range. With Edison Pearls, and their relatives, China has a class of pearly candidates worthy of competition in the fine jewelry saltwater pearl market. They are easily equivalent to the range of South Sea pearls in size, but cost less. The color and luster are different from saltwater pearls, so they fill a missing range of colors. The birth of the Edison pearl is a major achievement, a milestone in freshwater perliculture that sits on top of a mountain of experiments in nucleated and non-nucleated pearl experiments. With the Edison pearl, the Chinese have perfected the round nucleated pearl from a freshwater mussel. This represents a long journey of experimentation, to find and use the best variety of mussel and an expertise in technique, for if the technique of getting a round pearl from a mussel were easy, it would have been perfected quickly by the technicians trained in nucleating saltwater pearl oyster species. Instead, it is obvious that every stage in this journey of realizing a round pearl from a mussel has been time-consuming, difficult, frustrating, expensive, and produced a lot of weird shaped pearls. Fortunately, an expanding market for formerly weird pearls that people now regard as beautiful, like the fireballs, has made the freshwater pearl trade enormous and varied for every taste; none of which would have been likely had it been easy to get a round nucleated pearl from a mussel. Part 3 will cover metallic pearls and future trends in freshwater pearls.